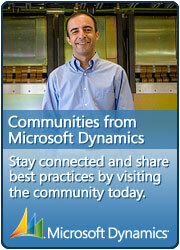 These tutorials are built using Visual Studio 2010 RC and .NET 4.0. RC. 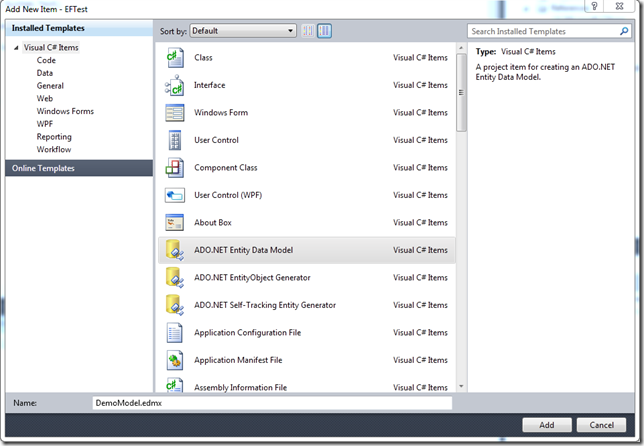 This means that Entity Framework 4.0 is used. 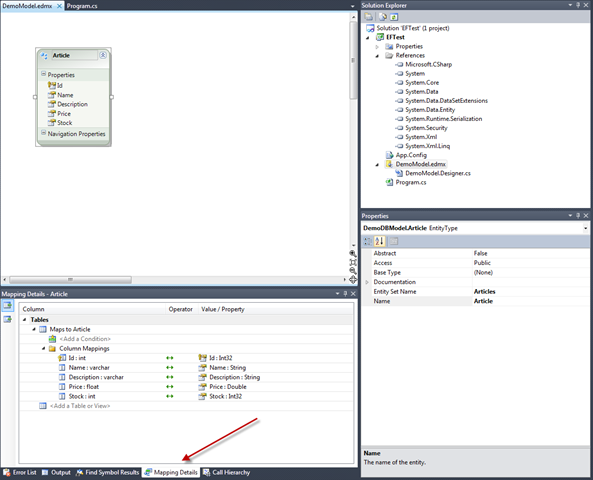 At the moment of writing this, VS2010 and .NET 4.0 are not yet released as RTM so information provided in this post could change in the future. 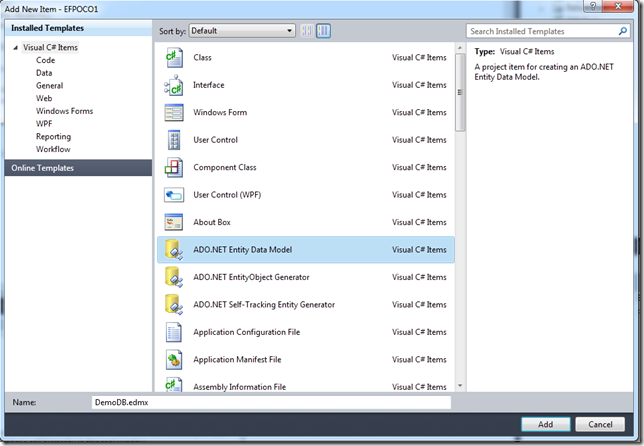 In the previous articles I mainly talked about things you could already do with eelier version of Entity Framework. 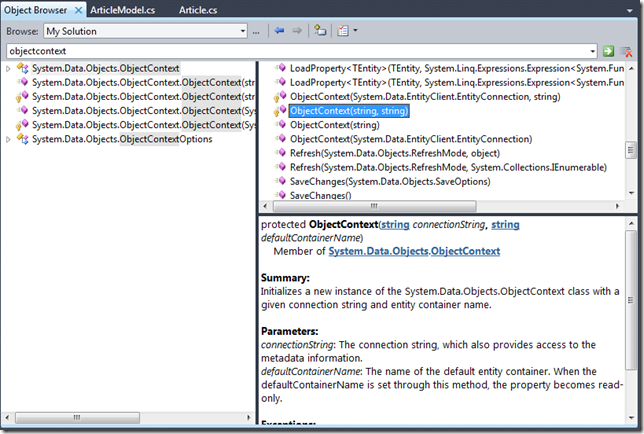 EF4.0 has some better tooling, we saw this already with the complex types. 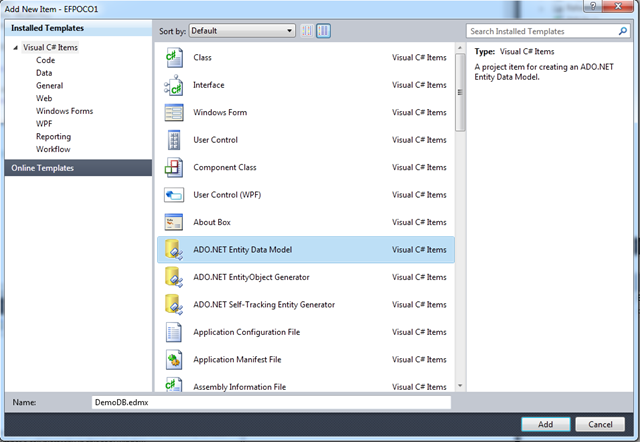 With the new version of Entity Framework there is also out of the box support for POCO (Plain Old CLR Objects). This I personally like very much because Iâ€™m not such a big fan of generated classes. Previously you didnâ€™t have much choice. You had to work with the objectâ€™s that EF generated for you. Did you have some specific logic in your property getters or setters? Then you had to find another solution. Remapping your objects to something else was one of them. You could not rely on these generated classes to contain custom business logic. 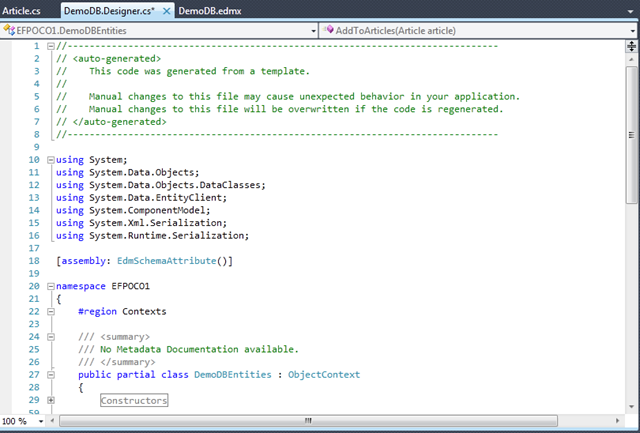 If you rebuilt the edmx, your custom logic would be removed and the classes would be regenerated. There were however some clever tricks to get POCO support working before EF4.0. 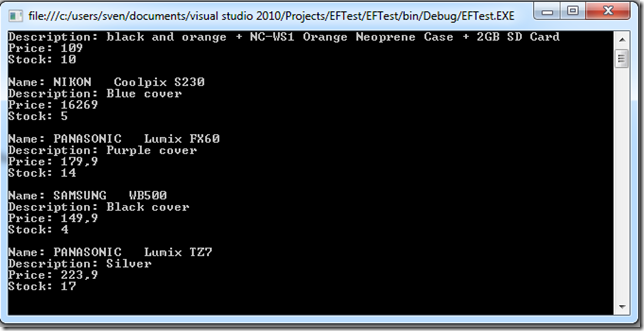 For instance have a look at: Persistence Ignorance (POCO) Adapter for Entity Framework. 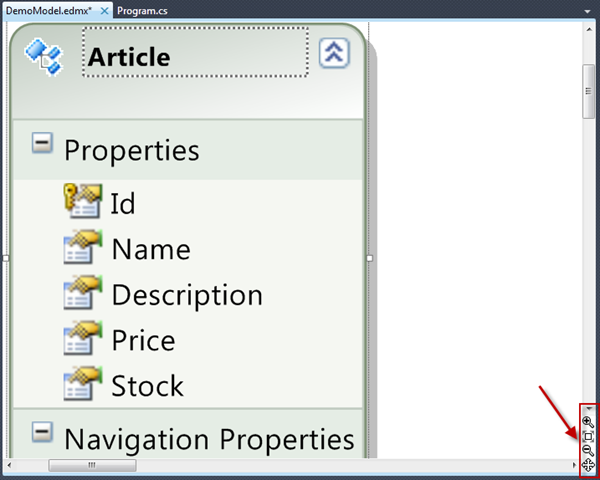 In EF4.0 we have POCO support, so we can use our own business objects, domain objects. so letâ€™s jump into the code and see how we work with that. Iâ€™ll use the same database as I used before. - Here we see the same screen as we did before. 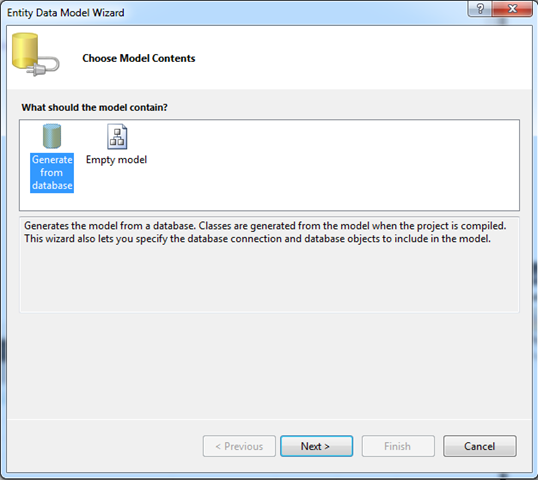 Again weâ€™ll create a model based on the database. This is not obliged. You could create the model yourself, but for this I would just let EF generate the classes for you. You will save yourself a lot of time. - Itâ€™s time to select the tables we want to work with. Iâ€™m just going to use the Article for this. - Letâ€™s first stop the auto generation process. 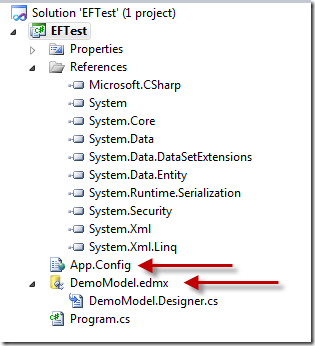 Select your .edmx file in the solution explorer and press F4 to open the properties window. 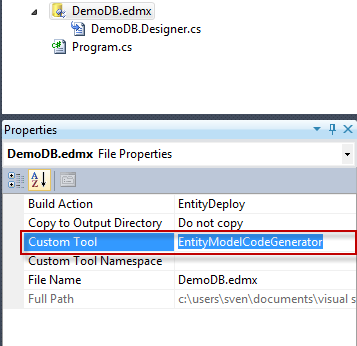 There you should see the property â€œCustom Toolâ€ with the value: EntityModelCodeGenerator. Go ahead and delete that value. Just make the field empty. If you rebuild now, youâ€™ll see immediately that the generated code behind file will go away. 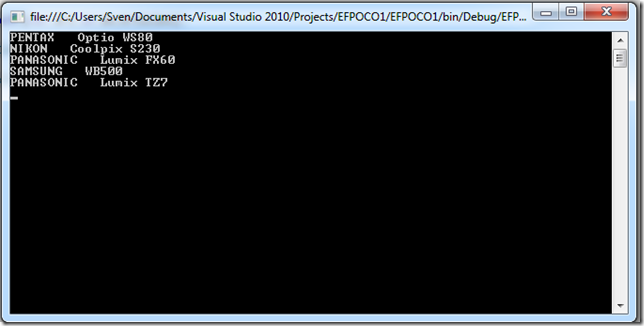 Now something short on exceptions because exception can occur while working with your own POCOâ€™s. 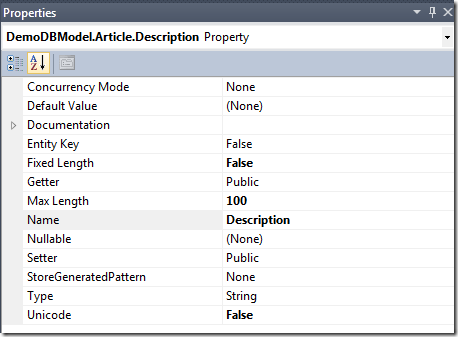 - Make sure your object properties are the same as the properties in your EF entity. If you donâ€™t have the same properties, then youâ€™ll receive an InvalidOperationException saying something like: Mapping and metadata information could not be found for EntityType ‘EFPOCO1.Article’. I donâ€™t like these kind of errors because they do not show which column is wrong. You have match every property and see which one is different. 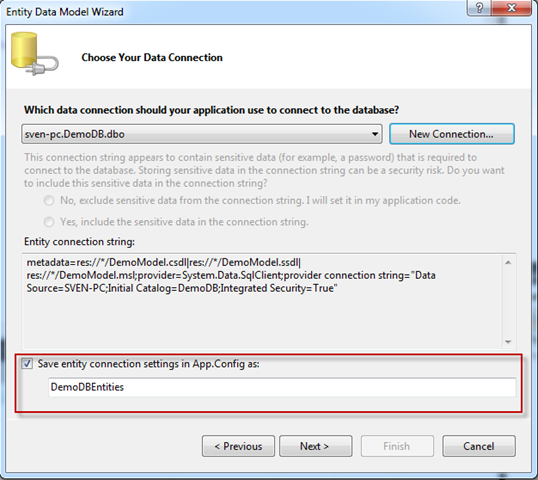 - Make sure your App.Config can be read. If the ObjectContext canâ€™t locate the App.Config or the name of the connection string is incorrect then youâ€™ll receive an ArgumentException saying something like: The specified named connection is either not found in the configuration, not intended to be used with the EntityClient provider, or not valid. OK as you can see it isnâ€™t that hard to use your own POCOâ€™s. Iâ€™m not saying EF generated classes are bad, itâ€™s just that if you have some specific logic that you want to have in your objects, then youâ€™re kind of stuck and need to be creative. Anyway, hope this was informative. 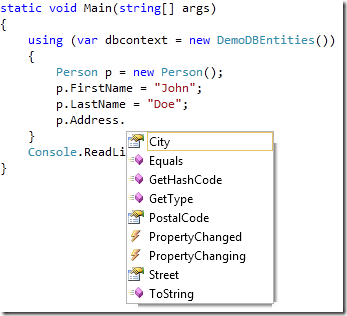 A complex type is a set of properties that you group together. 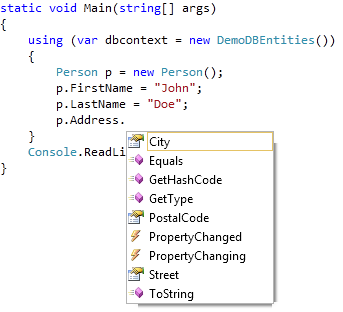 Sometimes your code becomes more clear when you group together properties. 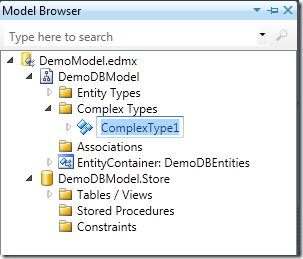 In this part Iâ€™ll show you how you can create complex types from the designer. Before EF4.0, you could also create these complex types. The only downside was that you had to do it manually in the conceptual model. In the previous post I created a new entity called Person. 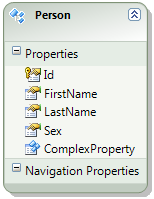 As you can see below, this Person entity contains all the classic properties. 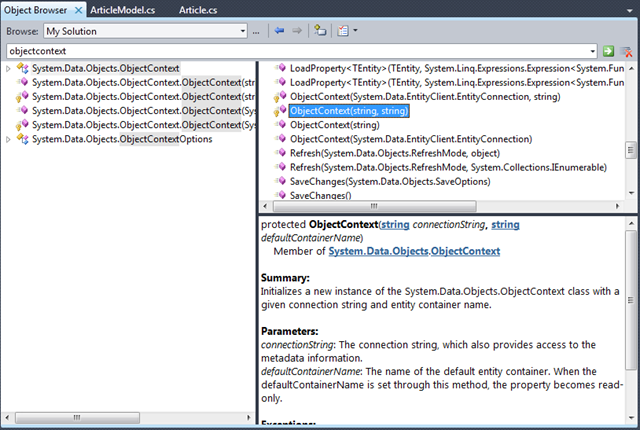 Now youâ€™ll see that the model browser comes up and adds a new Complex Type. Now letâ€™s give a more meaningful name. 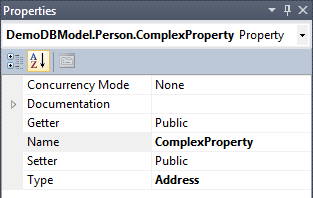 If you open the complex type, youâ€™ll see the properties that we previously selected. 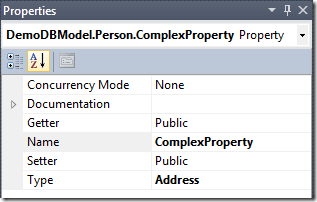 If you look at your model, youâ€™ll see that a ComplexProperty has been added to the list. If you look at the properties, you will see that the type of this ComplexProperty is actual the Address complex type that we just created. Iâ€™ll rename this to Address as well, it will make it more clear. 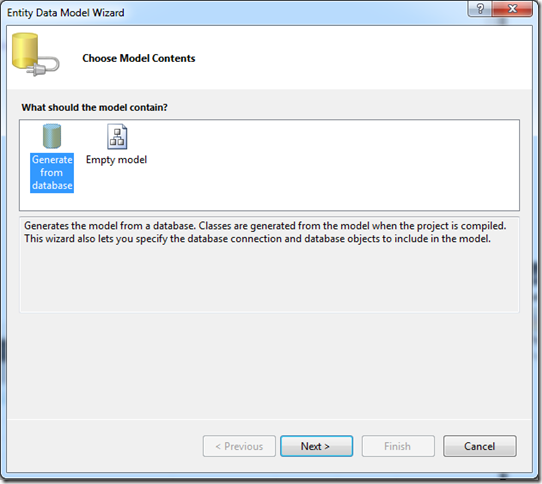 In Part1 we have created our model from a database. 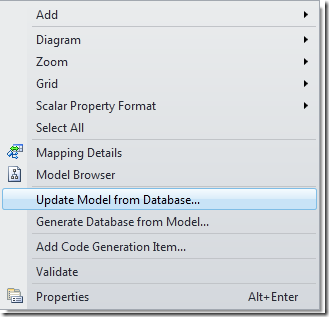 Now you have made some changes to the underlying database and want to update the model. For example: you created a new table in the database and also want to create an entity for this. No worries, you donâ€™t need to delete the model and regenerate it. This will open the Update Wizard. 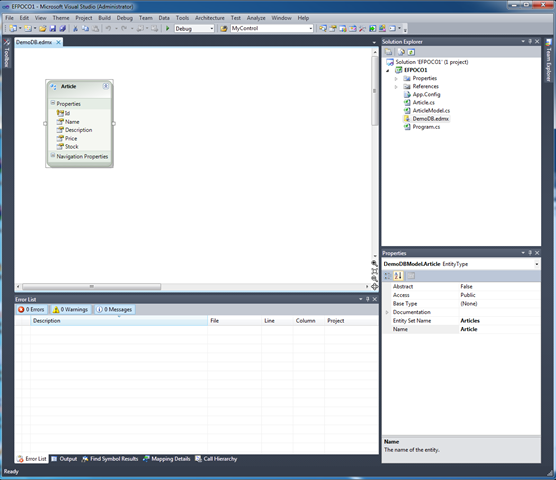 This window will show all the tables in the underlying database that are not yet represented by entities in your model. 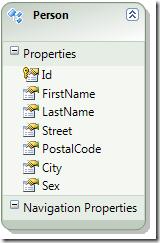 Here you can select the tables where you want to generate entities for. In this series of blog posts Iâ€™ll explain to you how to work with Microsoftâ€™s ORM, Entity Framework. 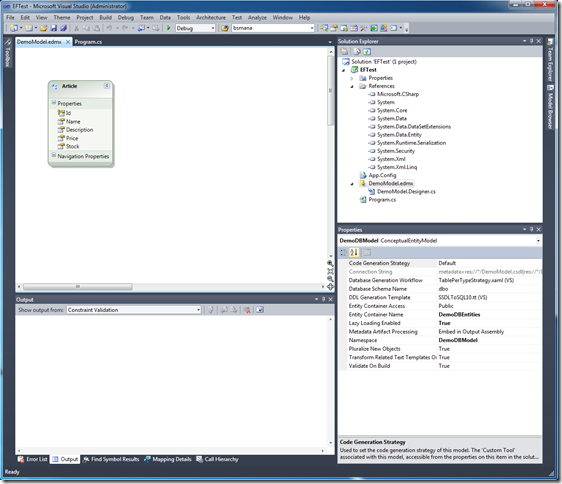 Version 4.0 is used during the tutorials. 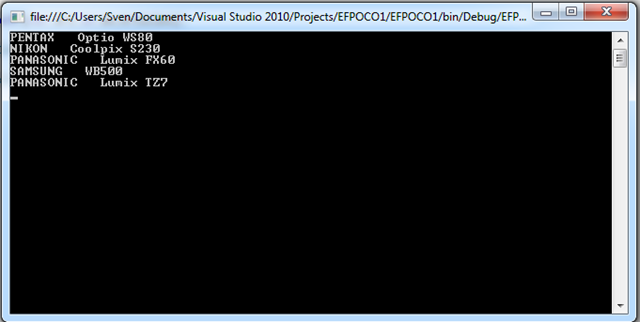 I didnâ€™t really blog that much before on Entity Framework because I thought the concept and usage was not ready. Now with the new release EF, I feel much more comfortable evangelizing it. 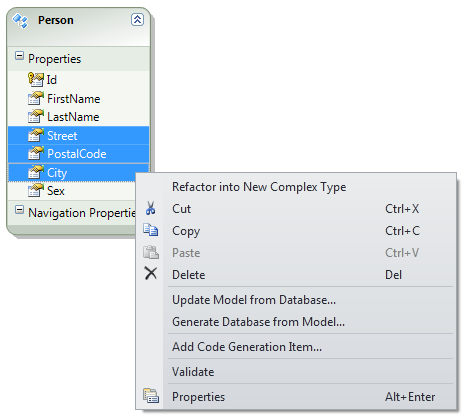 Following, Iâ€™ll explain to you how you can create an entity framework model based on an already existing database. Letâ€™s start by creating a new console application and add a new file to the project. 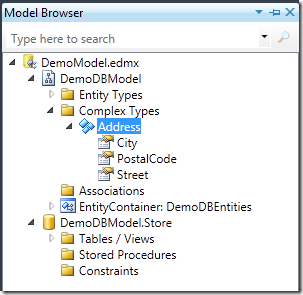 When the â€œAdd new item windowâ€ comes up, select ADO.NET Entity Data Model. Generate from database: Here the model will be generated based on an existing database with tables. 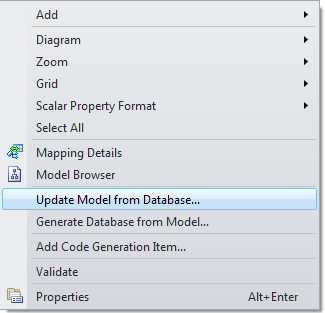 Empty model: Before Entity Framework 4.0 this didnâ€™t really do much. But now this has changed a lot! 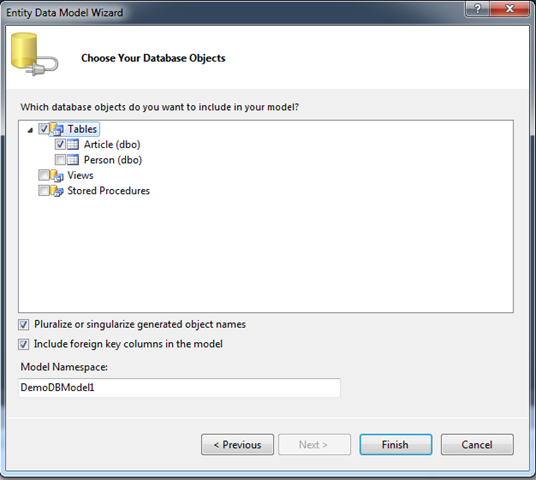 From here you can create your own model (using the designer) and even generate a database script (to create the database and tables). 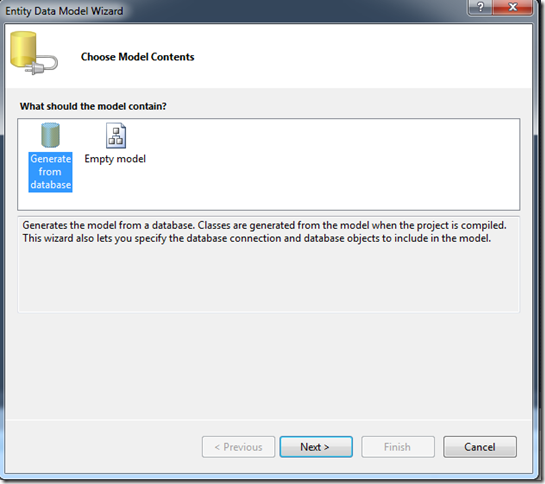 How you can start from an empty Entity Framework model will be discussed in an upcoming post. So we chose to generate the model from the database. 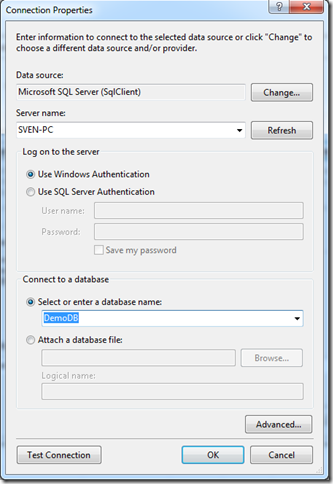 This means we have select our database and tables. 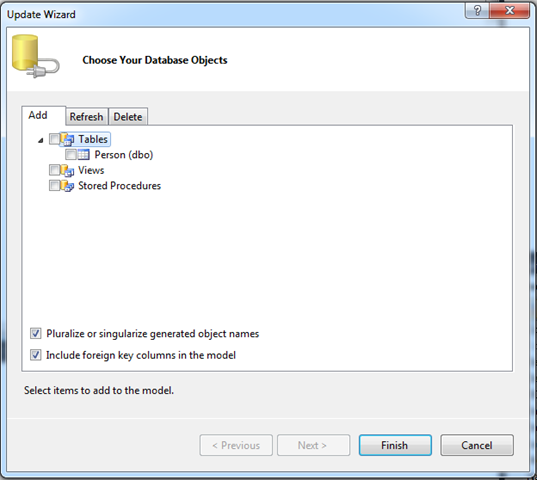 The wizard now asks us to select the database. Iâ€™m going to create a â€œNew Connectionâ€¦â€ because I havenâ€™t used this database before. This dialog window isnâ€™t new. 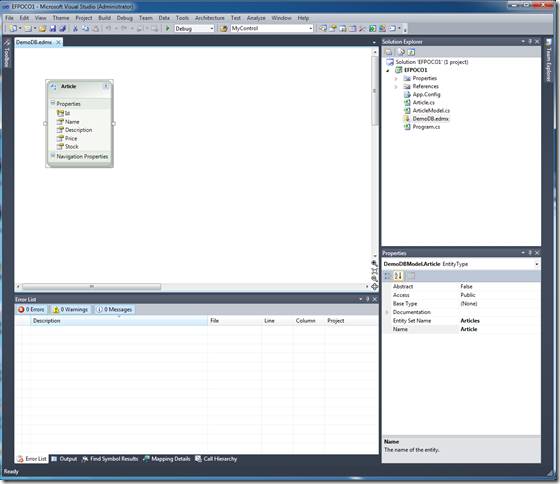 If you have worked before with databases in Visual Studio, you should already be familiar with this window. 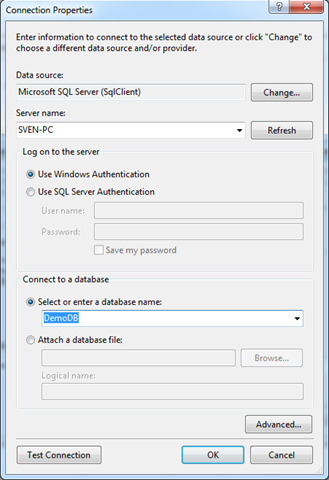 It just asks you to select a server name and a database on that server. 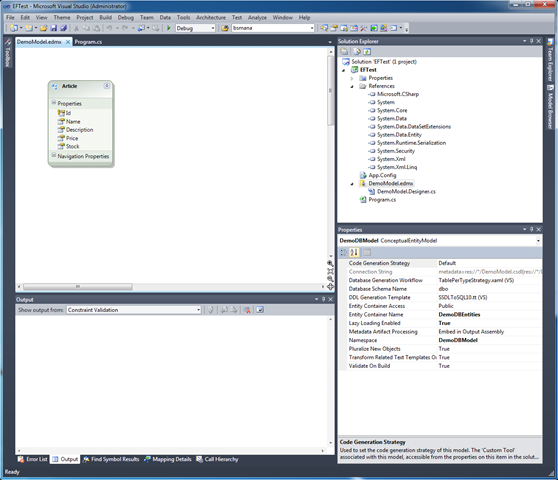 Once the database has been selected, the wizard will generate the Entity connection string. This is something like a regular database connection string. The only difference is that it contains more information on the Entity Framework model. 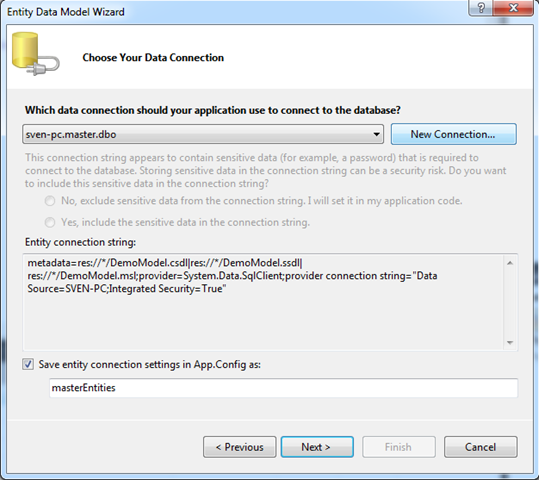 Make sure that you check â€œSave entity connection string in App.Configâ€. 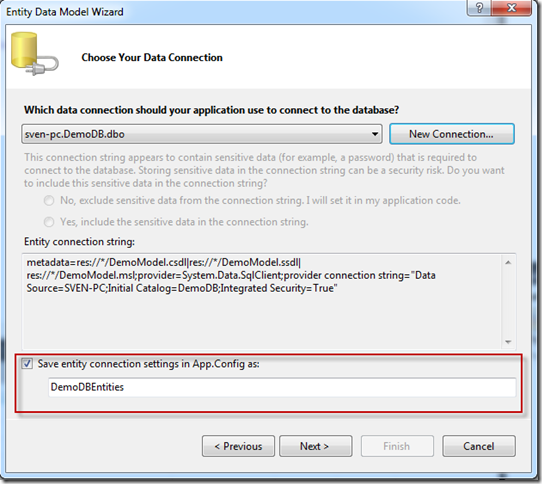 This will save the connection string to an App.Config file. 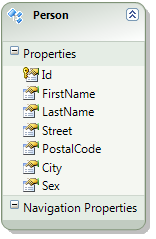 Next we need to select the tables where we want to generate entities for. In my demo Iâ€™m only going to work with the Article table. 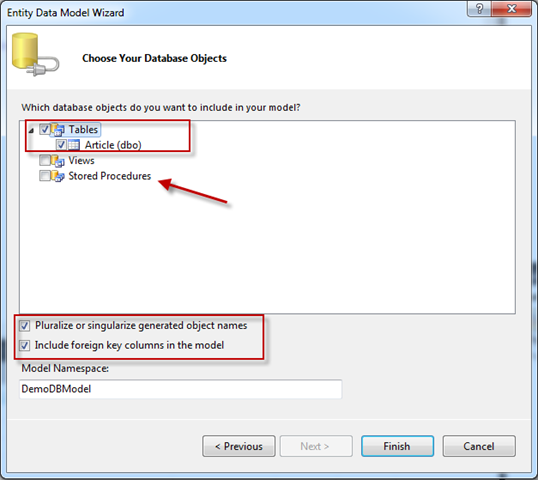 Notice that you can also add database views or stored procedures to your entity model. 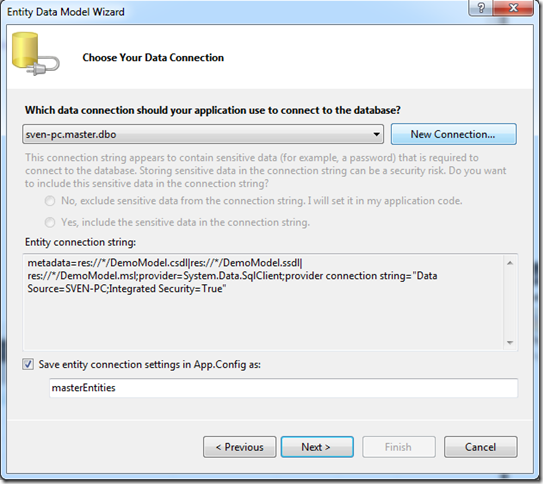 Make sure that you check the two checkboxes on this window. 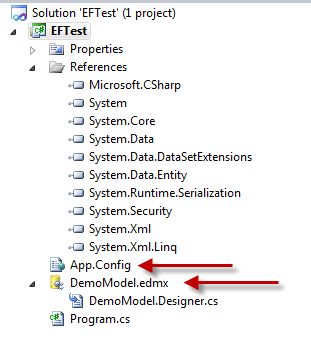 Once the model is completely generated, you will see that Visual Studio has created an .edmx file (the entity model) together with its generated code behind class and an App.Config (where we stored the entity connection string). 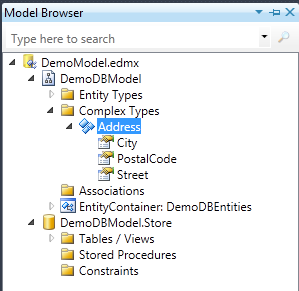 If you click on the .edmx file, you will see a diagram of the model. 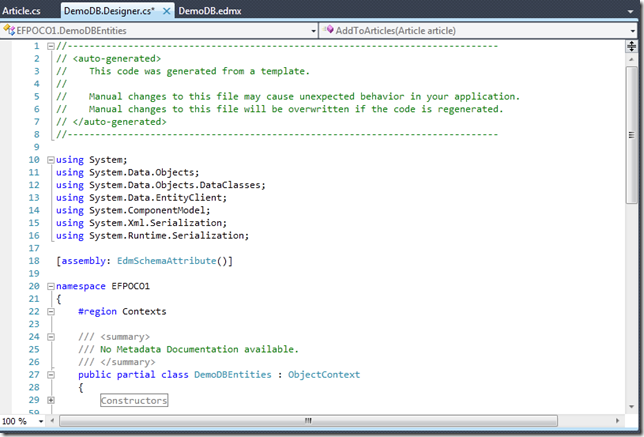 The WPF text editor in Visual Studio 2010 allows us to zoom the model in and out via the scroll wheel on the mouse. 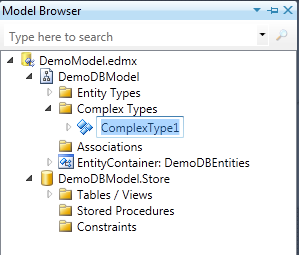 If you have a lot of entities in your model, you can easily get a good overview of the diagram. 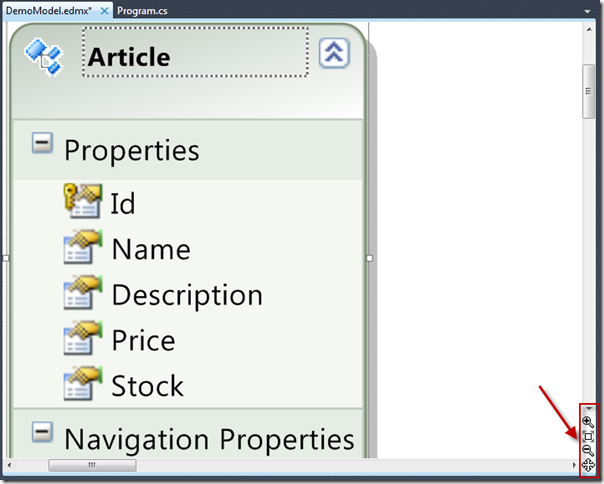 Under the scrollbar you have some different options to alter the view of the diagram. 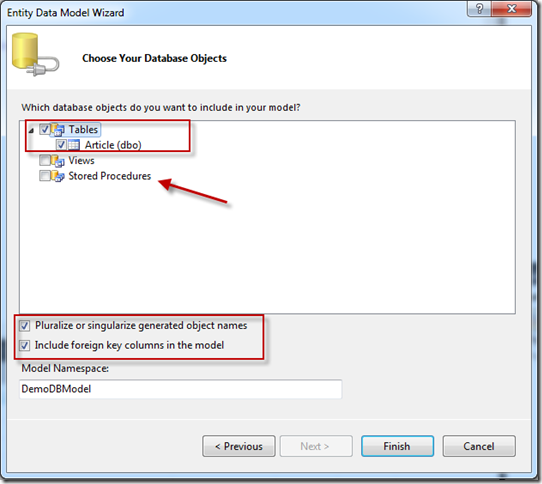 If you select an entity and click on the mapping details you will see how the table fields are mapped to the properties of the entity. 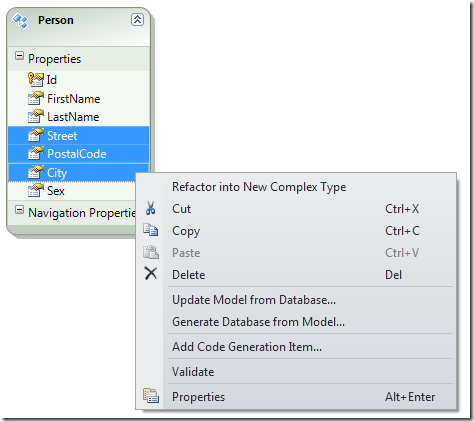 If you want you can change details in the properties window. 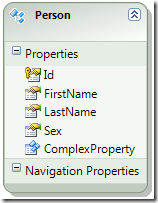 Information that was set on the table fields is also set on the entity properties. For example if you create a field in the table with a max length of 100 (varchar(100)) this will also be set in the entity property. This is not something that you will find back in the generated code behind class of the model. Itâ€™s actually stored in the conceptual model. 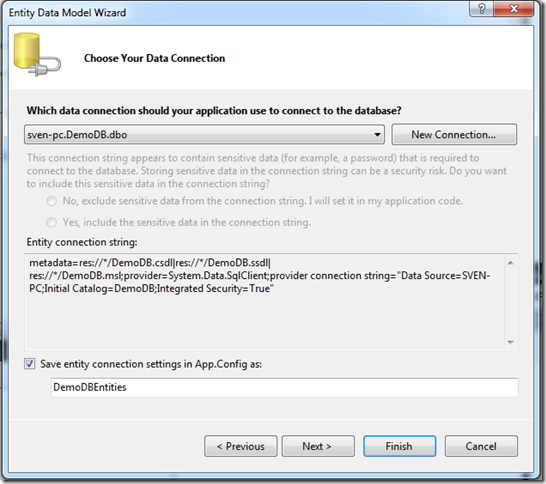 Now letâ€™s write some code to retrieve data from the database. 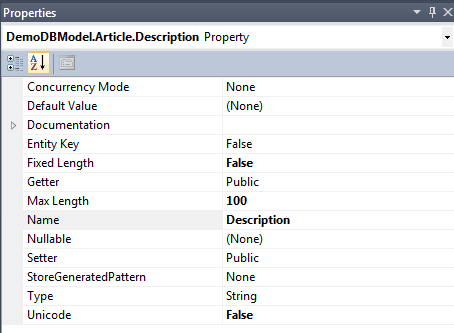 As you can see, you only need to create a new instance of you entity model. Then you can retrieve your records by calling the entity set of you entity. See how easy this is? If you have any questions or remarks, please let me know..